The Spidertrax ARB RD-99 Upgraded Engagement Collar is designed to maximize the performance of the ARB RD-99 Ford 9" Air Locker. It is in-house CNC machined from high grade, high strength 4340 chromoly steel and heat treated for further increased strength and wear resistance. 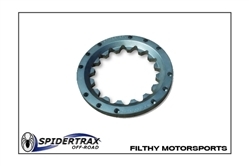 The shape of the Spidertrax engagement collar is also unique in design to improve engagement and disengagement during normal operating loads. Spidertrax images are © Copyright Spidertrax, used with permission.